“Go teach My people faith.” This was the mandate God gave Kenneth E. Hagin and that his family is carrying on. Rev. Hagin often cried out to the Lord, “How can we get this message out?” The answer came during Campmeeting 1973 when the Lord supernaturally revealed to him that it was time to start a Bible school. Not having any formal Bible school training himself, Rev. Hagin told his son, Kenneth W. Hagin, “You do it.” So in 1974 with a pad, pencil, his Bible, and his college handbook, the younger Hagin sat down to write the curriculum for Rhema Bible Training College. Classes began that fall, and 58 students graduated in the spring of 1975. Today the scope of Rhema has grown exponentially. RBTC has more than 28,000 USA graduates and more than 66,000 graduates worldwide. And there are 183 Rhema campuses in 46 nations across the globe. 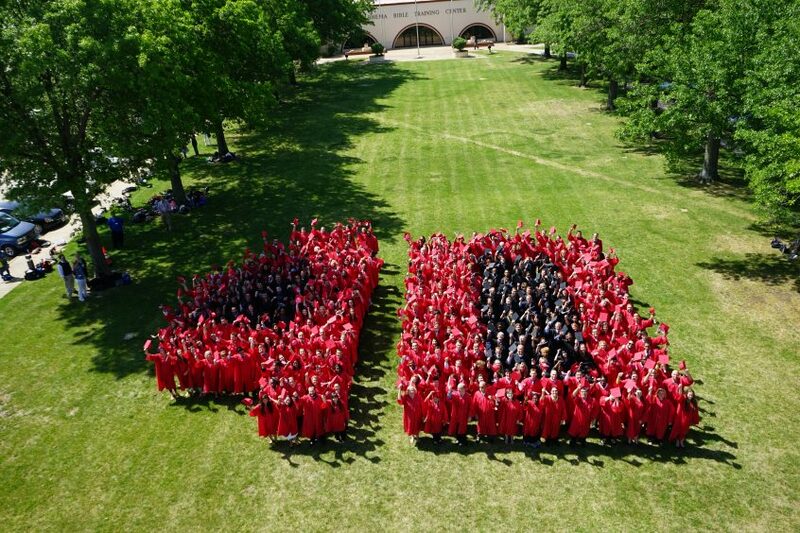 On May 16, 2014, more than 400 Rhema USA students graduated as part of Rhema’s 40th class. Along with their diplomas, they received their runner’s batons. These symbolize that it’s their time to run their race and carry on the mandate God gave to Kenneth E. Hagin years ago. Tiffany Loftus, who graduated from the Biblical Core program, says the faith message has changed her life. Tiffany was once a satanist, addicted to drugs and living in complete darkness. But as a single mother she gave her life to Jesus and things began to change. Over time she married and her family grew. Tiffany first heard about RBTC in 2009 at Lynette Hagin’s Kindle the Flame Women’s Conference. While listening to information about the school, she felt a tug in her heart that attending RBTC would change her life. She enrolled in 2011, and her life did change completely. “This place has taught me how to live,” says Tiffany. She has learned how to walk by faith and be a doer of God’s Word. “I know I can carry on with what I’ve gotten from here for the rest of my life.” She says being part of RBTC’s 40th graduating class is one of the most important things that has happened to her. Victoria Cardy, who also graduated from the Biblical Core program, says Rhema has taught her who she is in Christ. Challenges have come, but she’s learned not to quit. And she’s made divine connections and friendships at Rhema. Garret and Susie Dekker from Vancouver, BC, Canada, both graduated from the second-year program: Garret with a Pastoral Ministry specialty and Susie in Biblical Core. Susie’s parents also graduated from Rhema. Before he met his wife, Garret had never heard about the school. They said they could have come to Rhema at any other time, but God chose this time for them, and it’s been rewarding. Their years at RBTC have given them balanced teaching of the Word to prepare them for ministry. When Rhema graduated its first class in 1975, Kenneth W. Hagin thought if they could train 50 people a year, it would be wonderful. But God’s vision has proved to be much bigger! Rhema continues to train more men and women for the end-time harvest. The 40th graduating class of RBTC will be sent out, just as those before them have been, to touch more lives with the message of faith. Click here to learn more about Rhema Bible Training College.